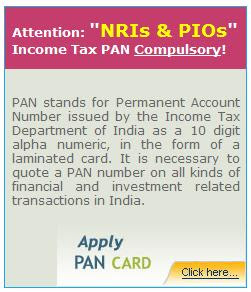 Is it Necessary for NRIs to have a PAN or the PAN Number? Permanent Account Number (PAN) refers to a ten-digit alphanumeric number, issued in the form of a laminated card, by the Income Tax Department in India. It is a must to have a PAN number for those who intend to do investments & file their income tax returns in India. It can be considered as a Indian Tax Number (Tax ID) and an ID proof.